I’ve mentioned before how much I love Influenster. For a little while I had only gotten a couple of random products to try out, but this month I scored a full VoxBox! Influenster is my favorite of all of the programs of its kind. Read on to find out why! Just in case you aren’t already using it, here’s a quick rundown on Influenster. It’s super easy to sign up. You fill out basic demographic information and then connect your social accounts (Twitter, Facebook, Instagram, etc). The more that you tell them about you, the more likely you are to get matched for campaigns. Sometimes they send pre-qualifying surveys for more information. They are always short and I would say I qualify a little less than half of the time that I get them. When you are chosen for a campaign, they notify you and you are then given some time of product or discount. The campaigns I like least are when you are just given a coupon for something. The ones I like most are when they send actual products in the mail for you to try. After you get the products, you have a list of things to do with them. You can do as few or as many as they suggest, but the more that you do, the more likely you are to get boxes in the future. In addition, you may be entered to win further big prizes from select brands if you complete all of the tasks for that brand. Activities you might be asked to do include: letting them know you got the box, posting pictures on Instagram, leaving a review on Target’s website, blogging, etc. I don’t always do everything on the list but I do make sure I spread the word about the products that I like. 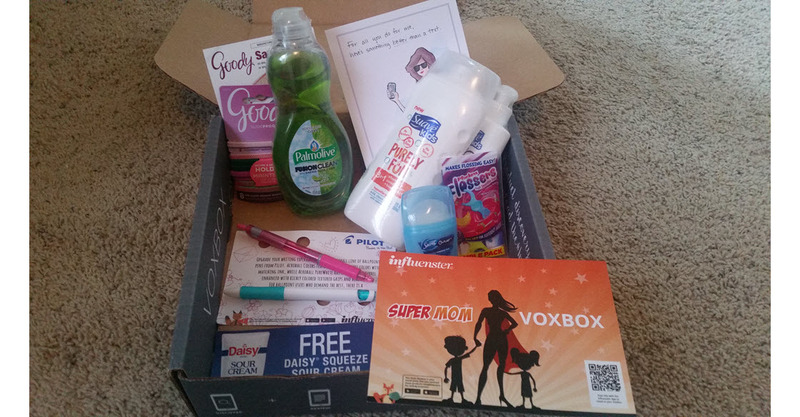 What Was in My VoxBox? This was definitely a box made for me! I was just at the store yesterday helping my 13-year-old pick out new deodorant because what she had wasn’t working. She has had good luck with Secret before, so we actually picked up a full size of the Outlast well as the sample size I got in the box. Every female in my house wears ponytails, so I know we will love trying the elastics. Basically I know I will use every single thing in this box! If you are interested in trying out free products, you definitely need to get signed up for Influenster!